SimpleCTMS is a Clinical Trial Management System (CTMS) for Sponsors & CROs. A fresh, easy to use web application. Flexible and affordable solutions. Amazing customer support. SimpleCTMS was designed and developed to offer the benefits of a CTMS (Clinical Trial Management System) without the extensive upfront financial and resource commitments associated with traditional enterprise systems or the inherent inefficiencies of worksheet trackers. SimpleCTMS provides early stage drug developers a scalable and cost effective solution to improve the management, performance and study startup costs associated with clinical trials. Secure cloud hosting in the US available from a validated hosting provider. Designed by clinical experts, built by technology experts. Backed by a quality system using validated software processes. Software-as-a-Service model includes monitoring and maintenance. A dedicated client manager provides pro-active support and guidance. All users receive technical support from our team of clinical software experts. Customized training and professional services are available at additional cost. System enhancements and updates are included. See Our Cover Story in PharmaTech Outlook! The March 2017 issue of PharmaTech Outlook features Trial By Fire Solutions' approach to transparency and affordability for CTMS. We are proud to be leveling the playing field for all clinical teams! See our cover story here! See SimpleCTMS at the Following Events! What People Are Saying About SimpleCTMS! Our SimpleTrials Product is an on-demand subscription based CTMS for Sponsors, CROs and Sites. Plans start at $99/month with no long-term commitment. 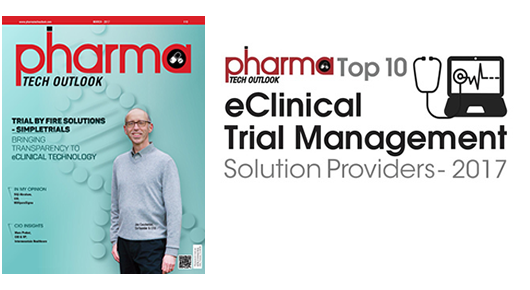 considering clinical trial management system adoption.